Japão, 2003 Cor – 90 min. Tokyo, 24th of December. Three homeless people find an abandoned baby. Gin (Emori) is a middle-aged alcoholic, Hana (Umegaki) a former drag queen and Miyuki (Okamoto) a sixteen-year-old girl who ran away from home. Gin and Miyuki want to take the baby to the police, but Hana manages to impose her motherly instincts and convinces her mates to look for “Kiyoko”'s mother to ask her why she abandoned her child. The investigation is not easy but a series of unlikely events puts them in the right path. 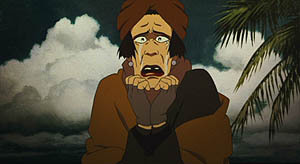 Kon Satoshi became famous for two animation films for a mature audience. The texts, aesthetics, composition and editing are much those of live action films with similar themes. 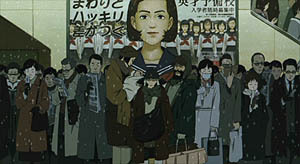 The simplicity with which the director handles the ambience and the chosen themes makes some of us wonder, “why make this with cartoons and not with live actors?” Kon, on the other hand, assumes his intentions to show that anime has much more to give than young girls in short skirts and giant robots fighting. 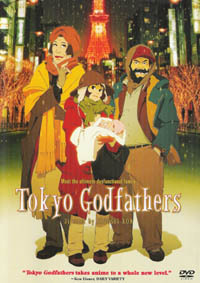 Tokyo Godfathers is substantially different from Perfect Blue (1998) and Millennium Actress (2001), the director's former works, although the characteristics of his style are still present. We stand before a light and funny film, opposing the dark thriller and psychological exploitation of his prior films. Kon Satoshi manages drama and humour applying parallel changes in the drawings and animation tone and design. The characters assume cartoon-like forms whenever assailed by some hysteria, turning back to normal for the more serious moments. Holding a baby, Gin, Miyuki and Hana argue about what to do. 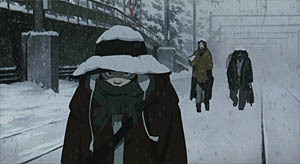 Beyond the contrast on the character designs, Tokyo Godfathers is a non-typical Christmas film, mainly because of its fierce pragmatism. Homeless people do not care about religious sermons, only abiding to them as a means to eat what is given them by a charity institution. Humour appears along an unlikely and complex investigation undertook by the “Godfathers”. Kon builds a narrative that, without getting sloppy, strongly depends on coincidence. Once we “get into” the joke, we accept all possibilities, the most foolish solutions and the sheer fun of a God ex-machina's copious mechanisms. The social-realistic aspect was an assumed risk by the director, for the majority of the audience would not be exactly eager to see a film whose mains stars were homeless people (furthermore a transvestite and an alcoholic). Another factor pointing out the work's realism is the use of real buildings and places in Tokyo, which were carefully adapted to the sceneries where the animation takes place. Trying to overcome any difficulties, the “godfathers” go in search of the baby's mother. Along the way, the protagonists find other characters neglected by society or to whom luck has simply turned its back: South-American immigrants, the couple who abandoned the child, the night club transvestites, other homeless people, etc. More than embedded in a Christmas spirit that will prize those who follow the righteous path — it is not exactly what happens, at least not to all of them — Kon creates a continuous chain of events destined to close the circle between the three characters and their relations to the past they chose to leave behind. Unlikely and unexpected encounters keep happening along the way. 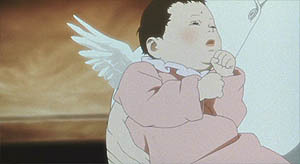 As the film unfolds, there are many references to angels: the place where we at first find Miyuki, the girl in the night club that meets Gin, the name of the teenager's cat and even “Kiyoko” will be referred to as such. But Kon, although resorting to fantasy ingredients, is not interested in religious elements and the narrative proceeds amongst the need for humour and the abuse of coincidence mechanisms. In the end, we will not hear that another angel has earned its wings. 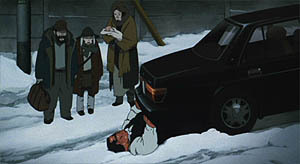 Although apt for family consumption, Tokyo Godfathers still keeps one of the director's obsessions: psychologically worn-out female characters, on the brink of despair, even though here the disturbed spirit is not one of the main characters. 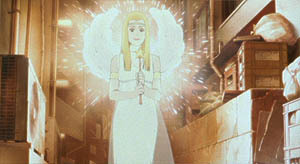 For a film turning out to be very earthbound, there are many angel images. Still a brief reference to the music of Suzuki Keiichi, from the Moon Riders (already 30 years old), who would in the same year collaborate with Kitano Takeshi in Zatoichi. During the final credits the Moon Riders play a song over Beethoven's ninth (according to Suzuki inspired by the work of Walter Carlos in Stanley Kubrick's A Clockwork Orange). 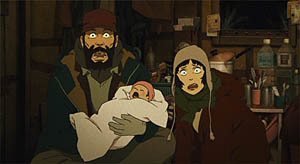 More than a Christmas film, Tokyo Godfathers is an excellent idea for a day at the cinema, either animated or not, any time of the year, one among many we would appreciate to have seen in our theatres. Sitges 2003 (Audience Award for Best Animated Feature Film and Special Mention). Released in DVD by Columbia, which should act as an assurance of quality, with standard extras and possibly without any redundancy regarding the soundtrack for all international editions. 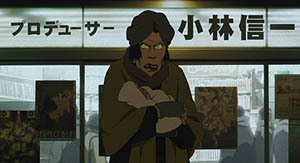 In this scene of Tokyo Godfathers we can see the posters of two former feature films by Kon Satoshi. 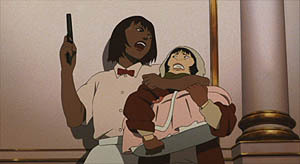 On the right, a reproduction of a drawing by Kon made to be released with the DVD (click to enlarge). The R1 edition includes a 22 minutes documentary piece (in Japanese, with subtitles) showing several phases in the production, premiere pictures and interviews. One of the most interesting aspects is the “interview” that actress Okamoto Aya does to Kon Satoshi. Trailers for Tokyo Godfathers, Astro Boy, Cowboy Bebop: The Movie, Cyborg 009, Memories, Metropolis, Returner and Steamboy. Anamorphic transfer (1.85:1), with slight windowboxing to make for TV overscan, with a single sound track — Japanese Dolby 5.1. Subtitles in English, French, Spanish and (Brazilian) Portuguese. 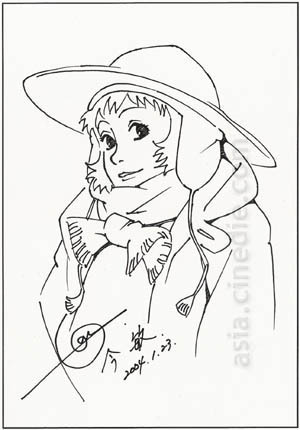 It also includes a reproduction (the size of the usual leaflet with chapters) of a black and white drawing of the character Miyuki, sketched by Kon Satoshi especially for this edition (signed and dated January 2004).